Nowadays, with the development of technology, the demand of entertainment is increasing day by day. That leads to the appearance of the puzzle game which serving to that demand. There are several applications as well as puzzle games for people to choose. But who spends or has the time to try all of them? We have a good announcement for those of us who love puzzles games. To help you reduce down your choices, beside Dragon Academy – an amazing puzzle game for you to play, we have gathered three favorite puzzle game applications for you to consider and download for using. Monument Valley is really a great puzzle game which earns some major style points. This is not your typical puzzle game because it actually tells the story of a lost princess. You will have to solve the puzzles and explore the new words to help the princess return home. That is really amazing way for you to enrich your knowledge. This puzzle game only looks great but also ignites your sense of discovery. If you are the fan of this types of puzzle game, so Monument Valley is the best choice for you. If you love to garden or feeling relax while playing puzzle games, Prune is the perfect choice for you. In this puzzle game, you will help people can find sunlight and flowers can grow by trimming tree branches. The important thing is if you trim the wrong branches, your tree will fall into darkness and wilt away. With the beautiful artwork and a relaxing soundtrack, Prune is an amazing puzzle game for you to play when you want to have a good place to take a break and relax. Rules is available for iOS devices now. This puzzle game sounds a little bit like the meaning which the name implies. It all requires players must to follow the rules. Your goal is to clear a set of tiles by adhering to the rules correctly. For example, you might need to remove tiles with animals at first. The clock is ticking while you attempt really hard each tricky level, and the only way to succeed is to make sure that you don’t break the rules. 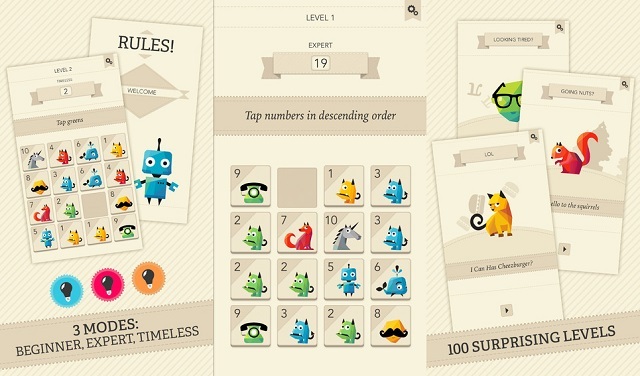 If you like playing visually interesting puzzle games that test your memory, we are sure that you will love Rules! In conclusion, if you want to exercise your brain or relax after a long day of working and studying, puzzle games are a perfect option for you. Anyone who is fan of these games will definitely get a kick out of these three interesting applications.